OK so everyone is talking about the teaser video for Insta360’s new camera, with various theories about how it was done. 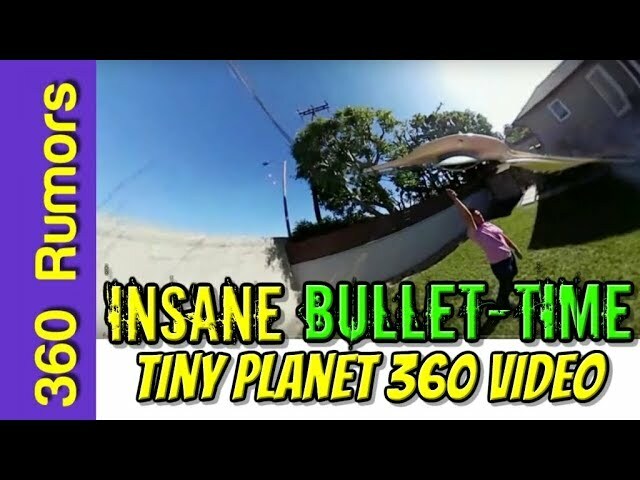 Here is a tutorial for making a bullet time tiny planet 360 video! When Insta360 posted the teaser video for their new camera with a bullet time effect, many people wondered how Insta360 made the video, with some wondering if it’s a drone and others speculating that the camera could somehow take an orbital 360 video. But no, the explanation is much more mundane. This effect is made with the camera on a string that is swung around, a technique first made popular by freeskier Nicolas Vuignier years ago. The reason the video looks like it’s barely moving is because it’s on super slow motion, which requires a very high frame rate. In this case, I used a 2017 Samsung Gear 360, which has a 120fps mode, albeit at only 1440 x 720 resolution. It appears that the new Insta360 cam will also have a high framerate mode. And because Insta360’s video was only 720p, I am also guessing that the resolution won’t be very high either in this high-fps mode. 1. A camera with high frame rate for super slow motion. The higher the frame rate, the slower and smoother the motion can be. 60fps is probably the absolute minimum for this effect unless you want it to look like stop motion animation. 🙂 If the camera has image stabilization (like the new Insta360 camera) that would be desirable but not absolutely necessary – you’ll see why below. Note that this doesn’t have to be a 360 camera but of course a 360 camera would allow you to change perspectives. There are many non-360 cameras with a high-speed / slow motion video mode, such as GoPro Hero5 Black (1280 x 720 @ 240fps or 1920 x 1080 @ 120fps), or Garmin Virb 360 (1920 x 1080 @ 120fps), and several smartphones. 2. A stabilizer wing for the camera. – Centripro for GoPro Hero 3 and 4. Find a suitable area with enough space to spin the camera and watch for bystanders. When you’re ready to shoot, switch to high speed video mode, and swing the camera around you. Note that each of the stabilizers above will fly “forward.” I find it is more interesting to have the camera on the bottom of the stabilizer, so spin the camera such that when it flies forward, the camera will be below the stabilizer. Depending on your stabilizer, that direction may be clockwise or counterclockwise. Note: You can walk while spinning the camera — just be careful of your surroundings. After shooting and stitching your video, it’s time to edit. During editing, you can use any video editor that has a function for slow motion (ideally with native 360 video support), such as Adobe Premiere Pro or Magix Movie Edit Pro Plus 2017. By default, the video you recorded will play at normal speed. You need to apply a slow motion effect to slow down the video. At 120fps, slowing down the video to 20% of its original speed will yield a frame rate of 24 fps which is still quite smooth. If all you want to do is make a spherical 360 video, then you’re basically done (after you stitch the output from the 360 camera). However, because high speed videos are usually at lower resolution, I prefer to output it as a non-360 with an extra wide field of view, which will make the lower resolution less apparent. To do that, you’ll need a software such as Insta360 Studio, which can render a 360 video as a non-360 video, while you have full control over the perspective of the final video. That’s all there is to it! For more techniques, please bookmark 360 Rumors, subscribe via email, and/or like the 360 Rumors Facebook page! thanks for the update. However, one question remains, how they were able to hide the string in their teaser video? You think they did in the post production or they used a very thin and almost invisible string/thread? On Nicolas Vuignier video and other DIY video you always see the string. Hope someone figures out what they used in the teaser video to hold the camera. Awesome find! Thanks Greg! I think whatever they used for the teaser video will be easily accessible to users. At least, that’s what I’m hoping. I’m hoping your right Mic. They should bundle an accessory after that teaser video. hm interesting! thanks for the tip vincent! TECHNIQUE: How to make a tiny planet reflection vortex ring!